Professors Jim McCluskey (University of Melbourne) and Professor Jamie Rossjohn (Monash University) received the state’s highest scientific honour, the Victoria Prize for Science and Innovation, for their work on how immune system identifies and fights disease. 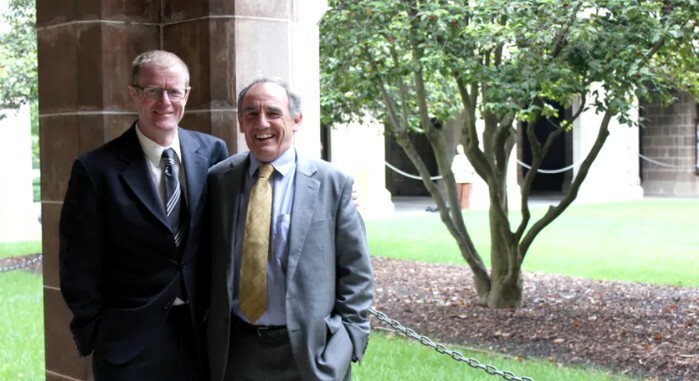 The award recognises a 15-year research partnership by Professors Rossjohn and McCluskey which has helped create better understanding of how T lymphocytes from the immune system recognise harmful microbes. Other awards recognising new and emerging researchers were also announced by the state government at the ceremony this week. The Victoria Fellowships are awarded annually to celebrate leadership, determination and creativity in Victoria’s science innovation sector, and to demonstrate the development of internationally significant research in the State. Two of the new and emerging researchers who received Victoria Fellowships were from our Department. PhD candidate Sarah Baines will use the award to travel to the University of Bath, in England and the Pasteur Institute, in France, to acquire specialised skills to identify bacterial genetic predictors of disease and explore the evolution and spread of drug-resistant S. aureus in Australia. Sarah will also attend the Gordon Research Conference on Staphylococcal Diseases, in the US. Dr Hamish McWilliam will undertake a study mission to the Rockefeller University, in the US, to enable him to acquire the technical skills to monitor protein trafficking in cells and understand how foreign molecules from bacteria are imported into human cells and presented to the immune system. This information is vital for developing specialist drugs that can boost immunity to life-threatening infections. This story first appeared in the University Melbourne Newsroom. Click here to view the original.